At Frenchies bicycle store we say the World Is Sweet at Any Age with a Bicycle! Visit Frenchie’s Bicycles at our location in Margate/Fort Lauderale -Broward County- You’ll feel like a kid again! Riding a bicycle is a different experience for everyone: For the BMX Bike enthusiast is the thrill of executing the routine flawlessly. For some, it is to cover a cross-country trail and be one with nature. For others, a bicycle is a commuting vehicle, or a way of burning calories, or relieving stress; for most kids is just the pure joy of riding. 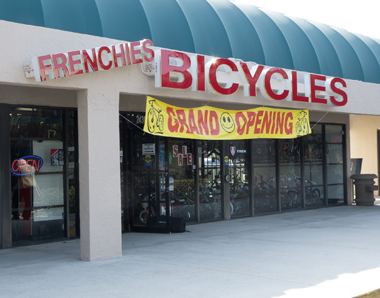 Visit Frenchie’s Bicycles at our address in Broward County! With more than 400 bicycles on display, it’s easy to grab one and take it for a ride. You’ll feel like a kid again. From BMX bikes, Recumbent Bicycles, trikes to electric bikes, and also exercise ones, we have something for bicycle riders of all levels. Looking for something that the entire family can do together that’s fun? Why not treat them to a bike outing? Frenchies’ Bicycles in Broward has bikes that you can rent. Do you want to spread payment over a period of time? Talk to us. Call 954-974-5340, or visit us today! What makes Frenchies Bicycle Store different? That is exactly the opposite of what happens when you visit Frenchies shop. Not only that you are in a warm “feel at home” environment. WE KNOW BIKES, we LOVE bikes, we live on cycles. The reason to be so thorough on the mechanical side of the bike is that we have learned that safety is paramount. All bicycles are assembled, calibrated and tested twice before going to the showroom or delivered to the ordering customer and again before leaving the premises. We want to make sure everything is perfect for you.